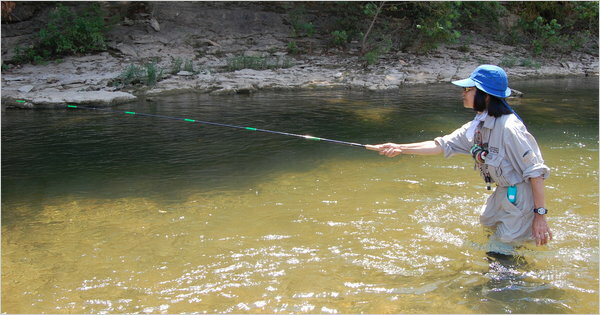 A Japanese Form of Fly Fishing Gains Fans in the U.S.
Misako Ishimura with a Japanese tenkara rod in Arkansas. She began fly fishing in the Catskills in 1989. CROOKED CREEK, Ark. — Misako Ishimura waded knee deep into the current, the water temperature perfect for both swimming and soothing relief from the afternoon sun. But Ishimura, 58, had other things in mind as she swept back her rod and flicked the line upstream in a controlled, gentle cast. The soft-hackle fly dropped into the surface film and drifted near a rock undercut. A shiver vibrated up the line, and Ishimura leaned back with her rod and brought in a scrappy longear sunfish. From a distance it appeared she was fly fishing in the usual style, but the long, supple rod that she cast had no reel, and the line did not run through guides. The line was knotted at the very tip of the rod and formed a direct connection between her and the fish. That is the minimalist essence of tenkara, a form of traditional Japanese fly fishing that has begun to attract anglers in the United States. Although the etymology is unclear, the name tenkara is thought to mean “from the sky” or “from heaven,” which may describe the situation from a trout’s point of view: a mayfly gently touches down on a coldwater stream, a free lunch from above. To the angler, the mayfly is an imitation on a hook and an effective and intimate way to connect with the fish.